I am definitely a team Smith fan and I understand ever you prefer a different Doctor. Matt Smith is my Doctor Who and he is the 11th Doctor. But now there is this t-shirt witch comes in 21 fun colors that has a big 11 on it and above that the word “Smith” it’s like how they do it on sports jerseys. The fun thing is that now as a geek people will think you like sports while you actually support Doctor Who. You can get this print on the front or the back of the t-shirt and the Doctor Who shirt comes in a range of styles for men and women and they even have a hoodie. 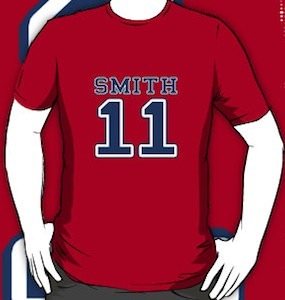 No more sports shirts for me I will go for this Doctor Who Team Smith 11 T-Shirt. Many Doctor Who fans are not old enough to know about all the adventure the Doctor had. But now there is this book that tells you more about all 11 Doctor’s and the friends and enemies it had to deal with all those years. This hardcover book offers 207 pages with facts and bits of trivia about the Doctor and the other character from this famous TV series. In the book you will find information about all 11 Dcotors and more then 200 friends and foes. And this Doctor Who encyclopedia has stunning picture to make the information even better. 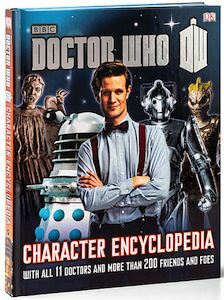 So if you really just want make sure you know it all then come and get your copy of the Doctor Who Character Encyclopedia. If you always wanted the 10 Doctor to stand in you home then you are in luck because this life size poster of Doctor Who can be yours so that he can stare over you all day long. This is a life size cardboard cut out poster of David Tennant as the Doctor. He is having his arms crossed like he used to do TV. This Doctor Who poster is 21 x 73 inch and that makes it the right size for any Doctor. So if you are looking to invite the Doctor to a party or just to come live with you then this is the easiest way to make that happen. Come and check out this Doctor Who 10th Doctor Cardboard Poster. 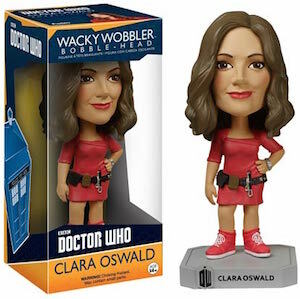 Did you always wanted to travel with the Doctor? Now you can with this cut out poster of Doctor Who. Ok it may not be very convenient but now you don’t have to wait for him to show up. This is a 6 feet tall free standing cardboard poster of the 11th Doctor. If Matt Smith your favourite Doctor then why not have him all for yourself. You can use this cut out of the Doctor for all kinds of things like a party or just to decorate your bedroom. The Doctor is not picky so you can do what ever you want with his cardboard version. Come and check out this Doctor Who Cardboard Cutout Poster Of The 11th Doctor. Are you sick of a dirty sticky table? If you are a Doctor Who fan then you are in luck with this Doctor Who coaster set. This set of coaster has 8 different Doctor Who coasters and each coaster has a different Doctor Who logo on it. And that means that now not only your table stays cleaner it also looks better with all those Doctor Who coasters. Each coaster is made from ceramic and has a felt back and measure 4 1/4 inch in diameter and that means that most cups and glasses will fit on it perfectly. As you know the 11th Doctor was not the first one there where 10 Doctor Who before him. On this 2014 wall calendar you can find all 11 Doctors and of course the Tardis. This Doctor Who wall calendar offers 12 months of Doctor Who fun. It is a special edition calendar like it is made for the 50th anniversary of the Doctor. 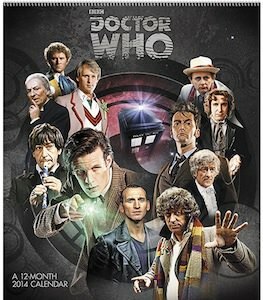 So if your wall still has room for one more Doctor Who item then you should check out this Doctor Who 2014 Wall Calendar. 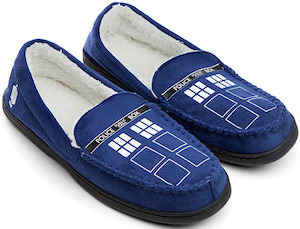 Drink coffee or tea in style with a Doctor Who mug. This mug is perfect for a nice cup of English tea or a nice coffee. And Doctor Who fans will like this mug because it has some nice Doctor Who details. 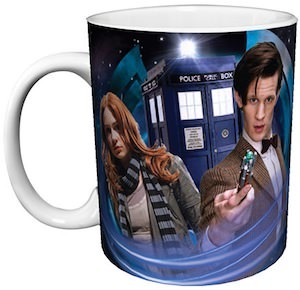 On this mug you can find the 11th Doctor with his travel companion Amy Pond and in the background you can find their travel machine the Tardis. This Doctor Who mug is made from porcelain and offers room from 11oz of your favorite drink. A mug like this makes a perfect present for a Doctor Who fan that has it all. Are you looking for that Doctor Who poster that tells you what you learned from all those hours you spend with the Doctor? 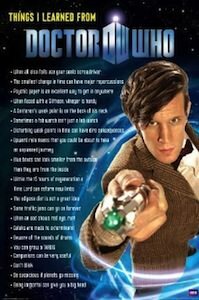 You are in luck as this poster says “Things I Learned From Doctor Who Poster” and it shows a picture of the 11th Doctor while he points his Sonic Screwdriver at you and besides him it says all kind things that you learned thanks to the doctor. Of course I am not gone tell you all of them but I can do one “Don’t blink”. This Doctor Who poster is 24 x 36 inch and comes just as poster or if you want you can get it framed to. Of course the poster will be shipped in a sturdy tube so that the Doctor will not get damaged. Come and have a closer look at this Things I Learned From Doctor Who Poster. The picture does not show the true niceness of this bracelet so click on the picture to have a closer look. And then you will see an amazing Doctor Who bracelet with two different charms that keep repeating. One charm shows Matt Smith’s face as the 11th Doctor and the other charm shows the Tardis while traveling through space and time. This special piece of Doctor Who jewelry is the perfect gift for a true Doctor Who fan. And this Doctor Who bracelet is 8 inch long and has 1 inch charms and a fold over clasp. So if you want some special jewelry with you favourite Doctor on it then come and check out this 11th Doctor And Tardis Bracelet. What is that two Doctor’s on one t-shirt! Yes the 10th and 11th Doctor are standing next to each other holding out their Sonic Screwdrivers ready to use it. Of course it looks like the famous scene from Pulp Fiction. And this t-shirt is not just a women’s shirt it also comes in a guys version so click on the picture above to see that version to. And this 100% cotton Doctor Who t-shirt is available in some other fun colors to. 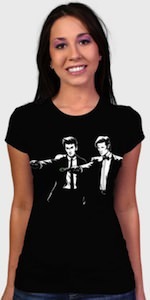 If you like to see David Tennant and Matt Smith work their magic as Doctors then you have check out this shirt. And you can get this amazing Doctor Who t-shirt in sizes Small – X-Large. So wait no longer, come see this 2e Doctors And Their Sonic Screwdrivers T-Shirt.